The smell of fresh paper and ink float through the air while metal clinks against metal at Acme Printing-Lithographers. Acme’s robin-egg blue storefront sits in the heart of Old Webster Groves on Lockwood Avenue and has been home to the family-owned and operated print shop since 1973. Judy Rath, one of five siblings who work at Acme, said her family has watched the printing industry change. Acme is operated by five of the seven Rath family children, each member has a specific role within the business. Dennis Rath is in charge of what Acme is best known for: its traditional 20th century offset printing. His brother Dan deals with the letter press. 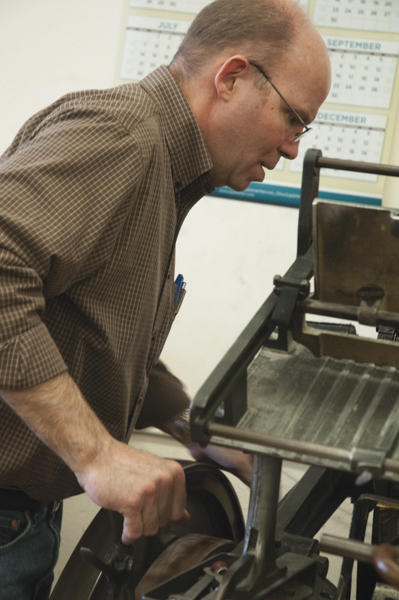 The letter press is used for finishing up projects — numbering and die cutting. The die cutting process cuts out particular shapes and patterns for certain printing projects. Dennis and Dan Rath learned their trade through offset printing classes at South County Technical College. Eldest brother Joe Rath is in charge of the sales and business aspects of Acme. He still knows how to print, having learned the technique from his father. Tucked away in the back of the shop, a large format camera sits inside a darkroom containing the chemicals to process film. Before a project can be printed, it has to be put on an aluminum plate. This is Harlyn Effan’s, the brother-in law’s, job. He takes photos of the designs, processes the film and places it on the aluminum plates — doing the work in the back of the shop so projects can move on to the offset printer. Before any of this can happen, the customer needs to choose a design. Judy Rath helps customers design their products and works on wedding invitations. These five parts are what keeps Acme printing unique and strong. Acme has completed printing jobs for Webster University, including Webster University’s literary magazine, The Green Fuse and cards for the May Gallery. Acme also used to help Webster Groves High School with a mentoring program that allowed students to come for two hours a week to learn the trade. The Rath siblings are proud of Acme’s traditional ways.